It may be the Southerner in me, but I'm an avid sender and supporter of a handwritten note or card. Growing up, my mother taught me to always send a thank you for anything and everything. Even the smallest gesture gets a handwritten card. So I've tried to carry this sentiment with me throughout life. 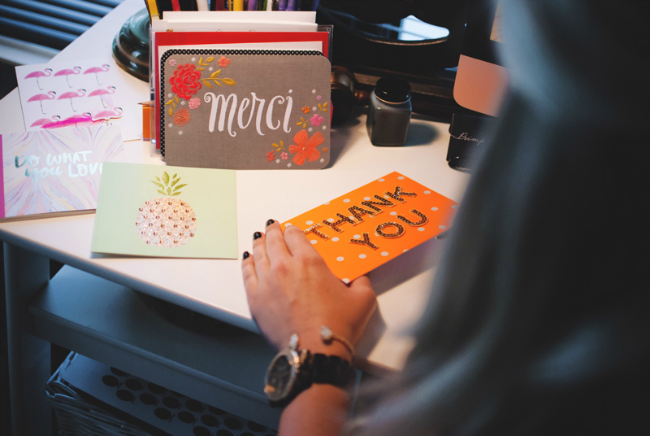 Last year I did a post featuring some thank you note etiquette. It got a wonderful response, so I wanted to share even more insight into the handwritten note. Why? Because we're approaching the season that I usually send the most amount of mail. So I thought, why not share a few more of my tips before the busy season begins. 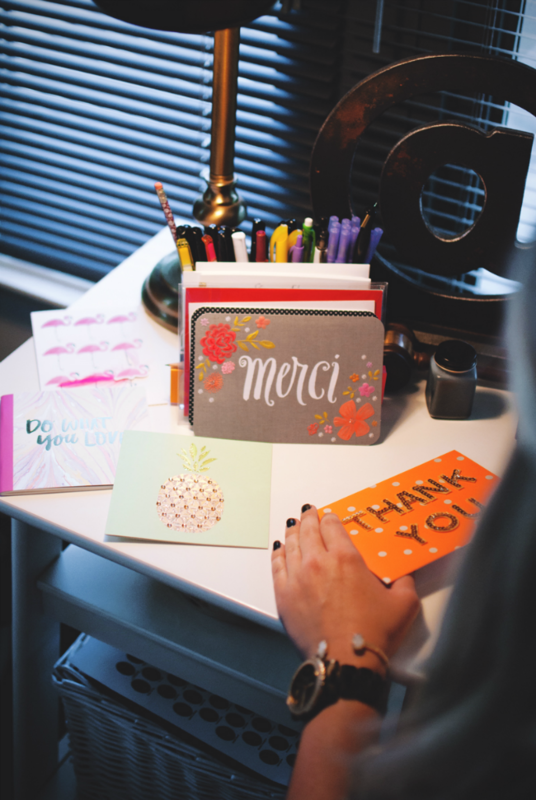 Always Have a Card On Hand // It's easier to send a thank you, note or card when you already have some on hand. Whether I have a purpose for a card or not, I tend to buy ones that I like and save for a special reason. Save Addresses // I keep a word doc on my desktop at work and at home, that lists friends, family, coworkers, acquaintances addresses. You can also store them in your contacts on your phone. That way you can easily access someone's address without heckling them every time you need it. Plus, it'll be 100% a surprise when they receive it! Personalized Stationery // Whether you're a male or female, having personalized stationery on hand is a must. The beauty of this is you can use these types of cards for anything and everything. Need to send a thank you? Want to congratulate someone for passing the Bar Exam? You can quickly snag a piece of your stationery. **Paper Source is currently offering 25% off personalized stationery right now!! Purchase Stamps in a Roll // While the initial cost upfront may seem high, having a large amount of stamps on hand will save you the trouble of having to run to the post office last minute. I keep a roll in my drawer at work and can easily grab one when needed. 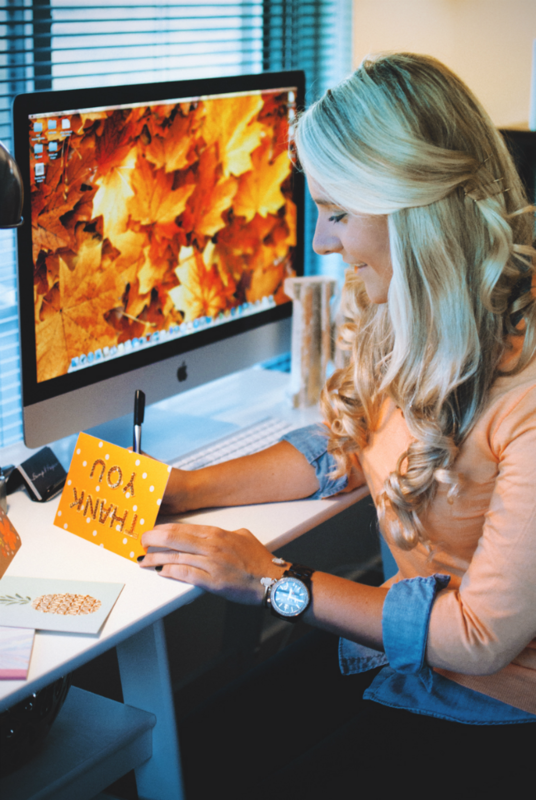 Skip the Boring Card // While it's nice to send a note or card either way, take the kind gesture one step further. There are so many amazing cards out there these days. Most recently, Hallmark created a new line of cards under their Signature series. I met with the ladies behind Hallmark Signature at this past summer's Southern Blog Society Conference. The cards they shared are VASTLY different from what you've seen before. They're bigger, bolder, totally on trend and some have really cool 3D features. A few of my favorites are featured in the photos in this post! I mean how cool would it be to receive a card like one of these?! Would make your day, right?! What about holiday cards? I know many people my age tend to overlook sending Christmas cards or New Year cards. Why? Because the cost can be pretty expensive. Holiday cards aren't just for families or couples. I love sending a little holiday cheer through the mail to friends and family! The key to getting a good deal is to shop early and buy in bulk. Buy Early // Most online paper shops will offer an incentive for buying early. As in, right now. Sites like Minted (currently offering 20% off), Paper Source and Hallmark can offer discount codes throughout September and some during October, if you buy early. Buy in Bulk // The more you buy, the more you save! Yes, you are spending more money overall, but you are getting more for that money. Plus, you'll think of last minute people that you may have accidentally left off your list. Or we're all human. You never know when you'll have a slip of the wrist and need to start over. Thus, it never hurts to have a few extras! **Photos by Lisa Chiu Photography. Handwritten notes/cards are the best! I need to remind myself to do it more often. They're such great surprises for people and I love getting them myself! Totally agree Rachel!!! Thanks for reading! Great tips!! I usually make my own cards but this would be easier lol They're so cute! !